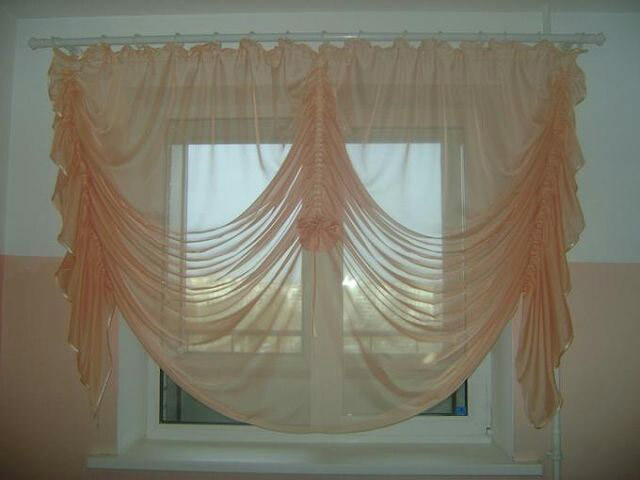 choose the appropriate for the overall interior design solution for textile window decoration. The modern textile market for the decoration of kitchen windows is incredibly diverse. 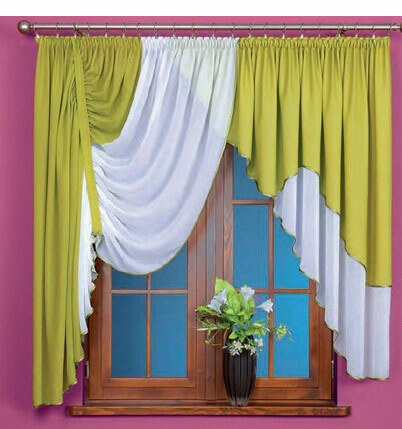 Designers offer us new color solutions and prints, fabric manufacturers find special innovative technologies that allow creating not only beautiful but also practical materials from the point of view of operation and maintenance. we suggest being updated with the latest trends in the design of window draperies by the example of our impressive selection of curtain designs for kitchen projects of various sizes and stylistic designs. 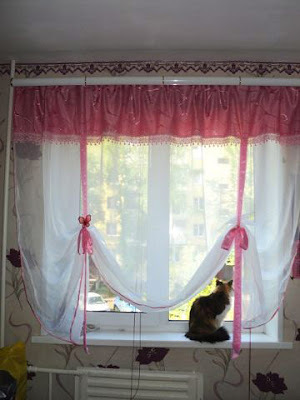 the budget for window curtain designs for the kitchen (the spread of prices, both on the fabrics themselves, and on tailoring products, is incredibly wide). 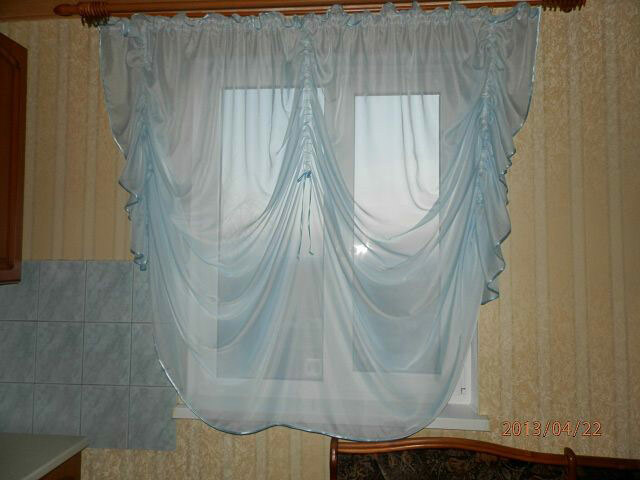 personal representations of the owners about the beauty and practicality of textile decoration of windows. 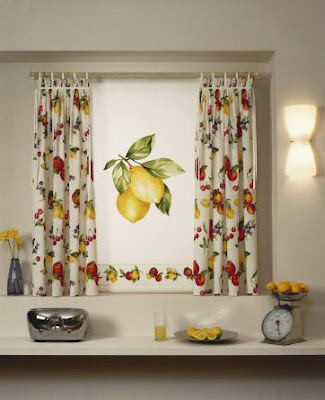 Classic or traditional kitchen curtains 2019 - a universal option for decorating windows in any room. And the kitchen was no exception. 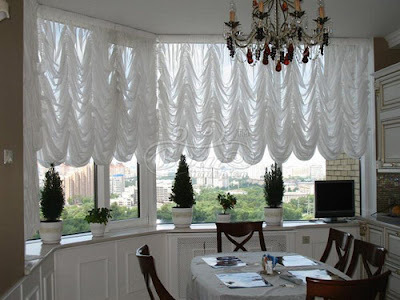 Choose traditional curtains and blinds can be the window of any shape and size, any stylistic execution of the interior design. Vertical fabric can help to protect the space from sun rays and prying eyes, become an ornament of the kitchen curtains and an effective finishing touch in the picture of the formation of its image. Effectively, traditional kitchen curtains and blinds are combined with Roman or role models of window drapery. This tandem is excellent for kitchen facilities located on the sunny side of the building or the first floor of the apartment building. 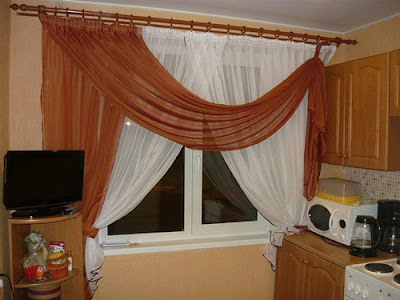 In this case, the curtains can both match the color, and be represented in a one-color version in combination with the printed cloth. 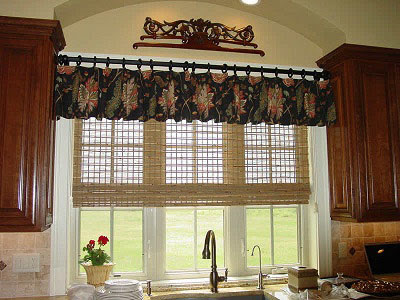 Roller or Roman blinds - one of the most common options for decorating kitchen curtains windows in foreign design projects. 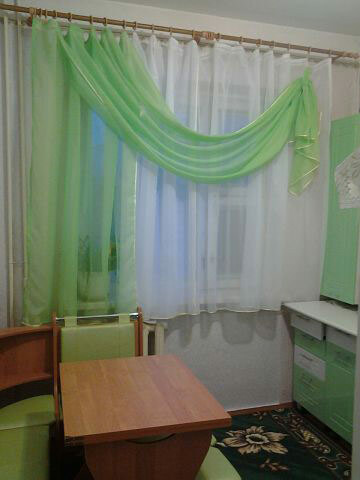 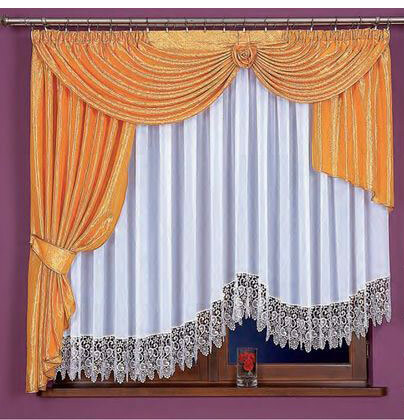 In Russian homes, the use of Roman curtains is also gaining momentum. For small-sized kitchen windows, roller blinds can be the best way to drape, given their simplicity and incredible functionality. In addition, for minimalist moods of modern style, roll fabric curtains are ideal. 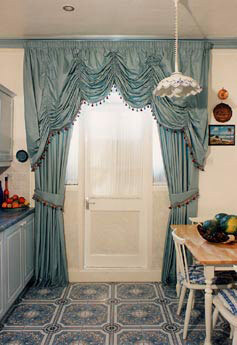 Roman curtains can be presented in a frame and frameless type of execution. 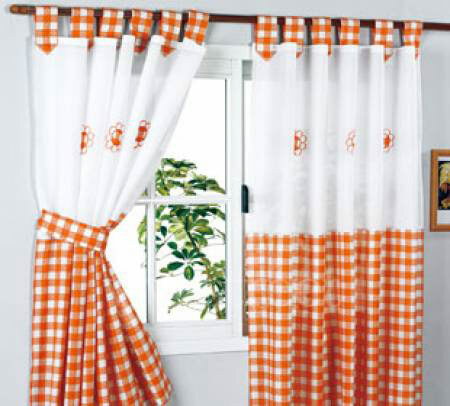 In the first case, uniform horizontal folds have a rigid coupling, in the second - fall soft folds. Which option is preferable - it's up to you, it all depends on the general mood of the interior design and your personal preferences. 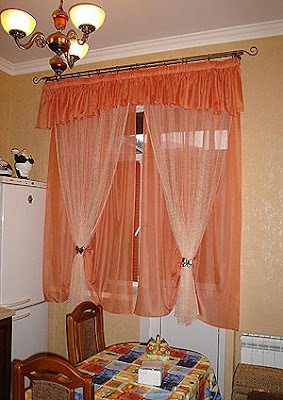 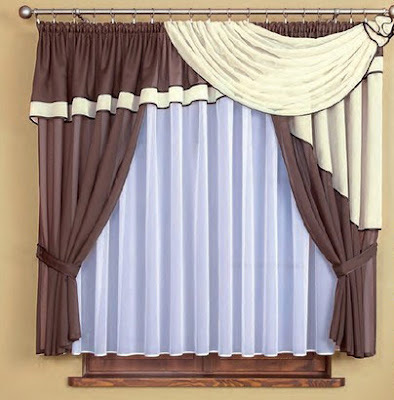 Curtains of this type are not without reason called "cafes" - this is the way to partially close window openings often used in small restaurants or cafes. 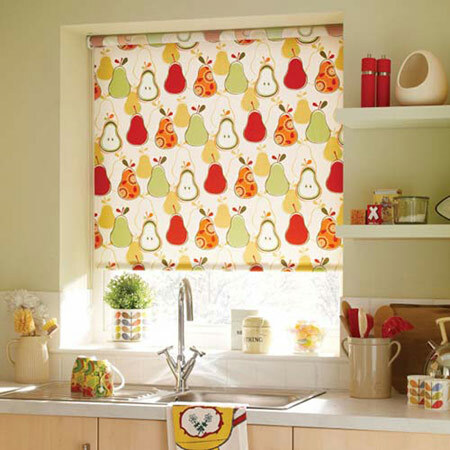 kitchen blinds that cover half or third of the window will not protect the room from the sun (this is not necessary for all kitchen spaces) but will hide it from prying eyes and bring a touch of coziness into the atmosphere of the interior. Before you start choosing a color solution for window textiles, you need to decide whether you want the textiles on the windows to become a bright (or simply contrast) accent or whether the curtains should merge with the overall palette of the kitchen interior design. The choice of plainclothes or fabrics with prints will also be influenced by the overall color palette of the room, the color of the decoration of walls and kitchen curtains facades because it is the design of vertical surfaces and a furniture set that forms the image of the kitchen. 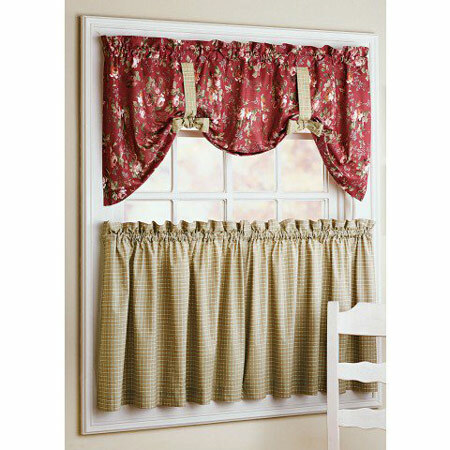 Curtains without a pattern are the simplest and most versatile way to decorate kitchen windows. 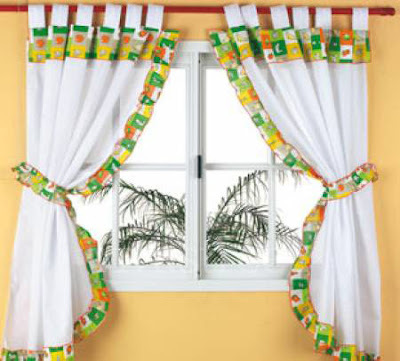 You do not need to think about combining the print on fabric with other elements. 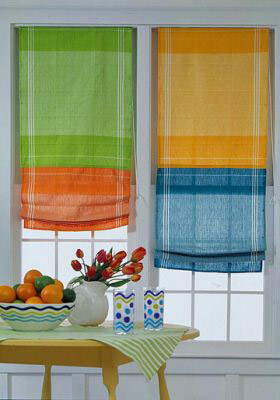 It is enough to choose only the very color of the textile design of the kitchen curtains window. 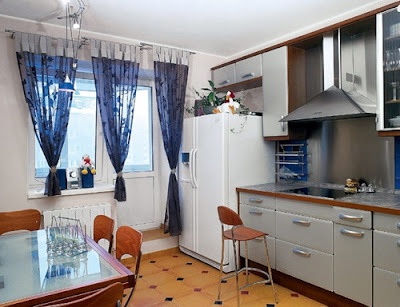 And in this case, there are several options that can organically fit into any interior of the kitchen - no matter what color palette and stylistic performance were chosen for it. 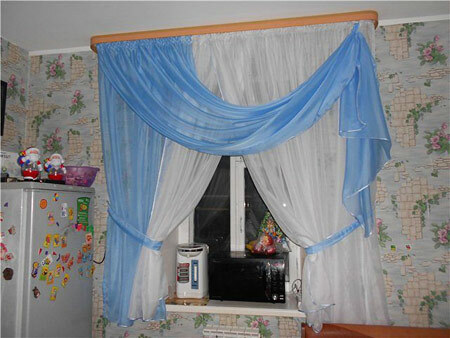 One of these options is white curtains. 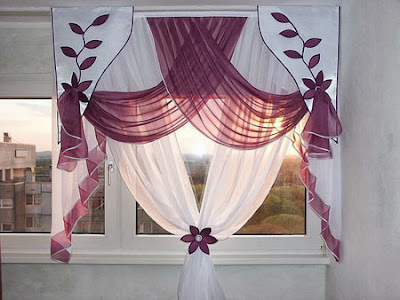 What trends did not offer us designers and white color will always attract buyers with its versatility, purity, and ease. 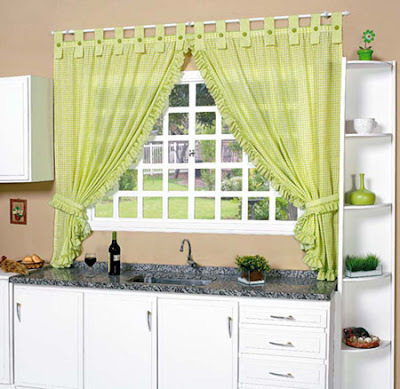 White curtains are easily combined with any color solutions adopted in the design of the kitchen, always look fresh and even ceremonial. 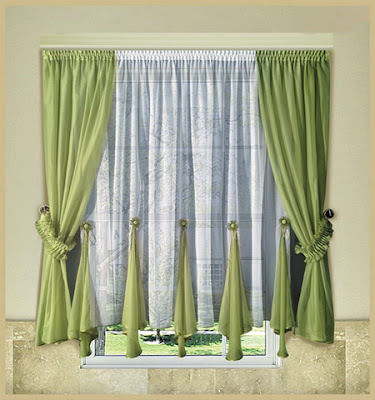 Another universal color for the execution of window drapery - gray. 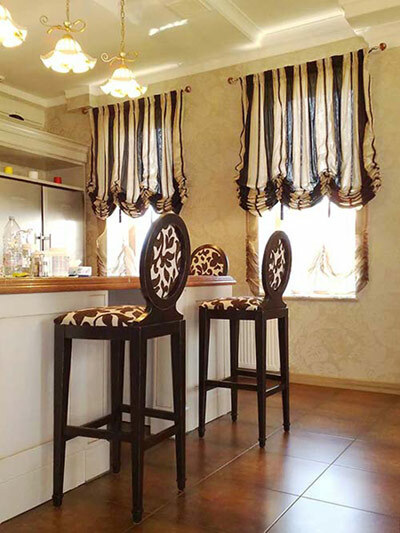 This color has a lot of noble shades, capable, if you do not become the center of attraction of views, then serve as an excellent neutral background for other, brighter interior items. The gray color is easy to combine with different color solutions for finishing and the execution of kitchen facades. 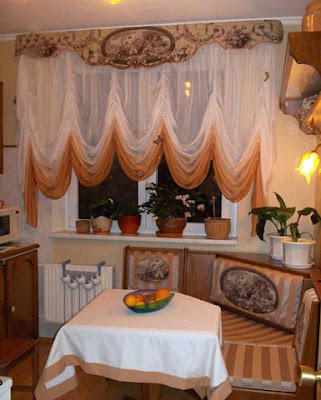 And to bring an accent to the resulting interior, one is enough (if the room is small) or several bright details (if the dimensions of the kitchen permit). 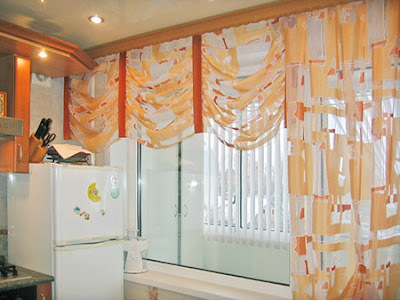 The use of curtains as an accent element is a spectacular design example that is often used in modern kitchen design for kitchen projects. 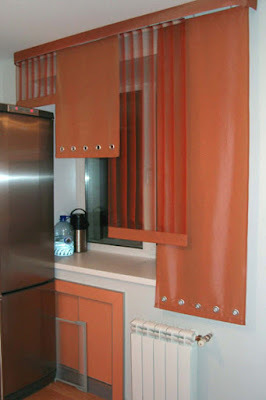 It is great for kitchen spaces of small and medium size. All the surfaces of the room are made in neutral, most often light colors and as bright elements, window drapes of a particular modification are used. This way of registration is easy to implement independently, without the help of specialists. Dark, deep shades attract their dramatic character. 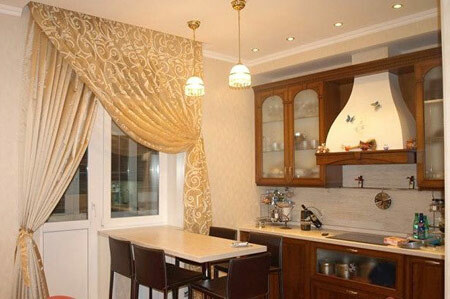 But not many owners are able to decide on the use of dark, even black curtains when decorating the kitchen space. 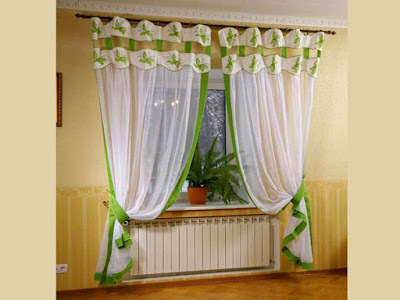 This design technique is really very bold, it is suitable only for premises with a sufficient area. 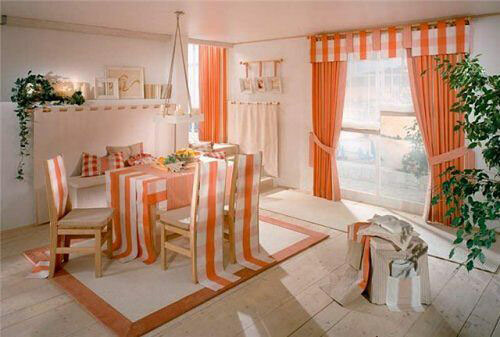 But how spectacularly contrast design looks in the interior of modern cuisine. 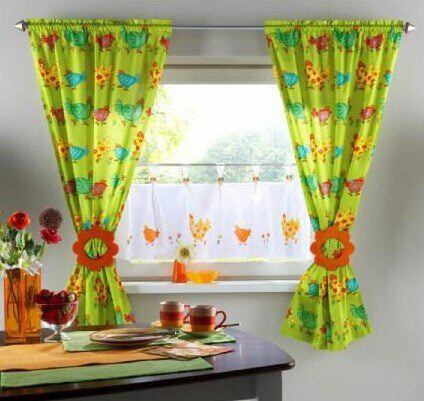 One can not answer uniquely the question about the most popular prints that are used in fabrics for kitchen curtains 2019. In many stylistic directions, there are established patterns of application of this or that drawing of textiles. 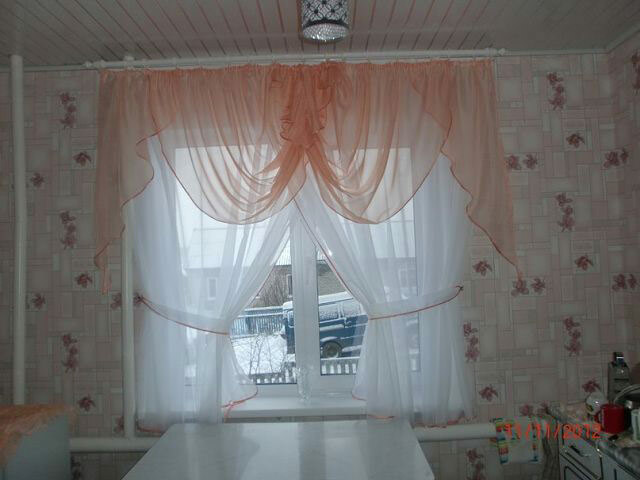 For example, in country stylistics, you can often see the cloth in a cage or a small floral ornament. 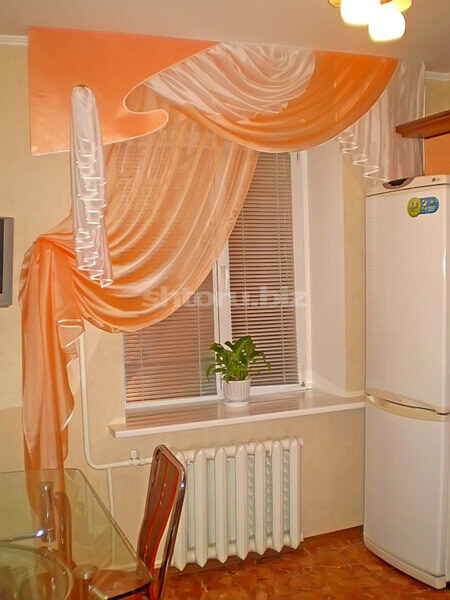 However, this print cannot be used in any of the interior items.